Nobody starts at the top. Long before they were household names, all of the superstar science fiction and fantasy authors in this anthology were just fans with stories and dreams. 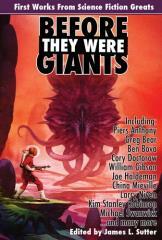 Now, for the first time ever, fifteen of the genre’s most important authors have come together to show off their first published SF stories, many of them rare and never before collected. All fifteen stories come complete with brand-new retrospective critiques and interviews from the authors themselves, discussing the stories’ geneses, humorous anecdotes surrounding the stories’ publication, and what the authors know now about writing that they wish they’d known then. An invaluable look at the origins of speculative fiction’s greatest minds, and bursting with insightful advice for beginning writers, this book is a must for any science fiction or fantasy fan, aspiring author, or teacher. Piers Anthony: "Possible to Rue"
Ben Bova: "A Long Way Back"
David Brin: "Just a Hint"
William Gibson: "Fragments of a Hologram Rose"
Nicola Griffith: "Mirrors and Burnstone"
Joe Haldeman: "Out of Phase"
China Miéville: "Highway 61 Revisited"
Larry Niven: "The Coldest Place"
Kim Stanley Robinson: "In Pierson’s Orchestra"
Spider Robinson: "The Guy with the Eyes"
R. A. Salvatore: "A Sparkle for Homer"